I am using these words from Malcolm Gladwell today because it fits well with my feelings on the painting I am showing here. By that I mean that this is a piece on which my mind has changed over the years, from feeling it was okay at first to loathing to grudging acceptance to now actually liking it quite a bit. 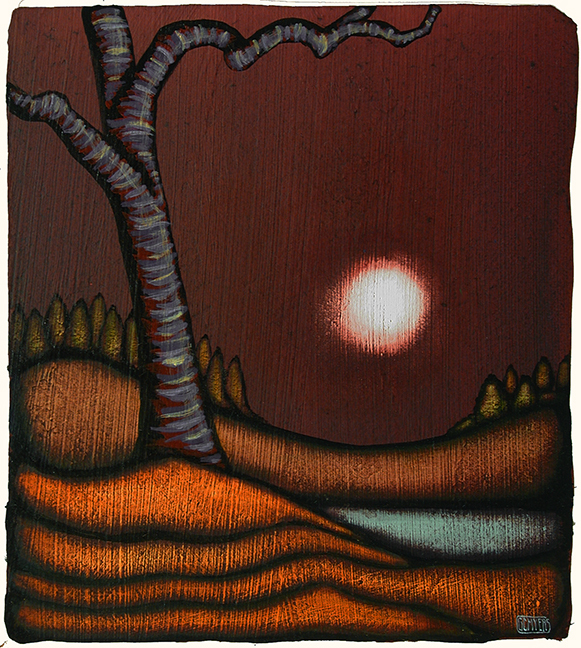 It’s a small painting, something like 7″ by 8″ on paper, from 2006 that is titled In the Eye of Grace. When I first finished this piece it felt pretty good and evoked an emotion that hit a mark for me. It wasn’t blessed with that initial giddy excitement that often comes when finishing a painting but it felt right. It was good and I felt confident in showing it in the galleries. So it was framed and sent out. It never found a home and came back to me a year or two later where it has been ever since. After being with it for a while, I began to actually dislike this painting. It bugged the hell out of me and I could never determine why that was the case. I finally decided that it might be the way it was framed, set in a very wide mat and an extra heavy wide frame. It was a cumbersome setting for a small piece and I began to realize that I didn’t like– actually, I hated– the grandiose feeling of the frame for such a quiet small painting. It was like having a small simple gem placed in the middle of an overly large and ornate setting. Overwhelmed and eclipsed. So I began to accept that I was letting my judgement be swayed by its setting. I no longer cringed when I came across it in the studio. It felt okay enough. But in the past several months I placed this painting, still in its fat frame, in a place where I saw it while doing my morning workout. I began to really look at it and my doubts and distaste faded away. It was like I had disregarded the title I had given the painting years ago, In the Eye of Grace. It did have a simple grace that was easy to overlook. It became a favorite in my morning ritual. I determined that I would change the frame to one that would let its grace shine through a little more easily. It’s funny how things sometime change, how even my own perception of a piece of myself can transform in several directions through the years even while that piece of self remains the same. I start my day by reading your blog. You have a gift for uplifting the psyche. Thanks so much, Cath, if I may call you that. I don’t know about any gifts but it sure helps knowing that people are out there reading and, hopefully, getting something from it. All my best to you. Wonderful painting and quote! Will be sharing the lines on Twitter. Thanks for this post. So glad you enjoyed the painting and the quote. Thanks for taking the time to read (and share) my work.